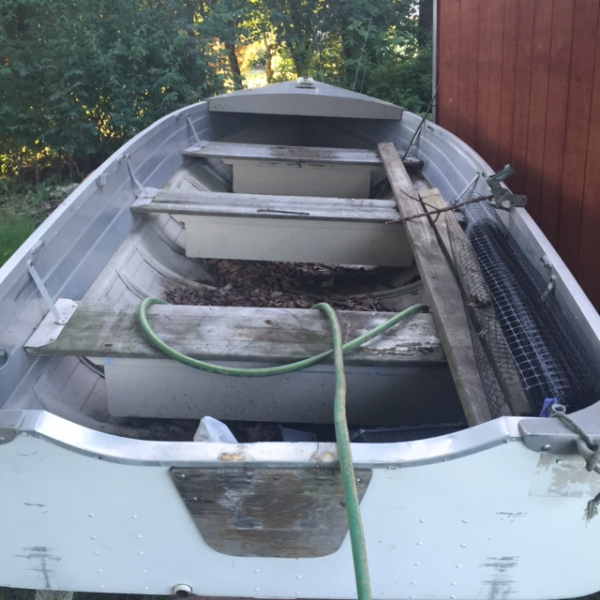 I posted over in the boat house the other day asking to help ID this boat. Well for $200, I took a risk and bought it today. 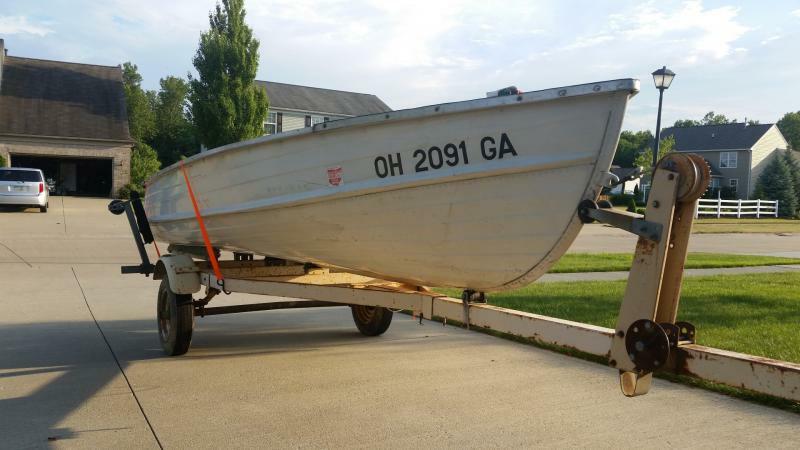 Was given the original title for the boat and the trailer. Original owner purchased 4/14/1966, was purchased at auction in 2010, and then purchased by me today. 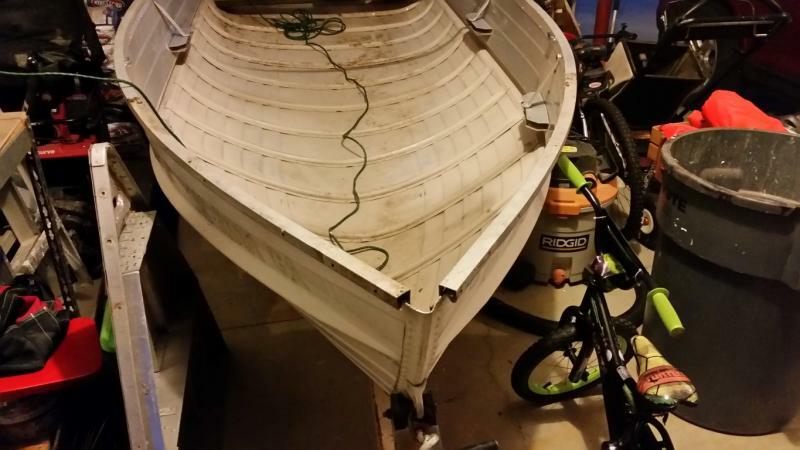 This is my first boat and look forward to getting into better shape for my 5 year old son and me. 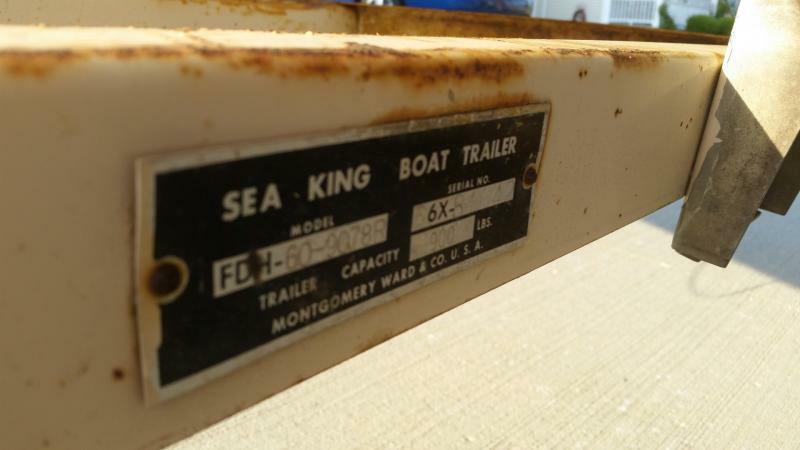 It is a 1966 Sea King, 14', Model 60-9036. 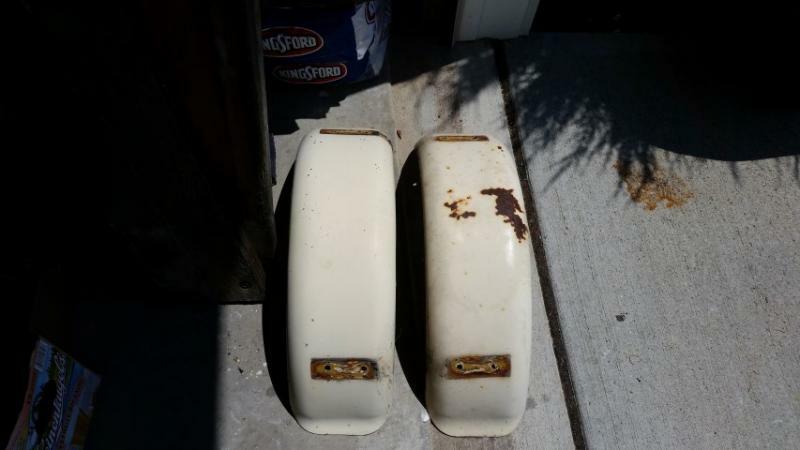 Anyone know anything about these boats? I had no idea it was 50 years old and now I want to know all about it's history. - Check for leaks - filling with water ok? 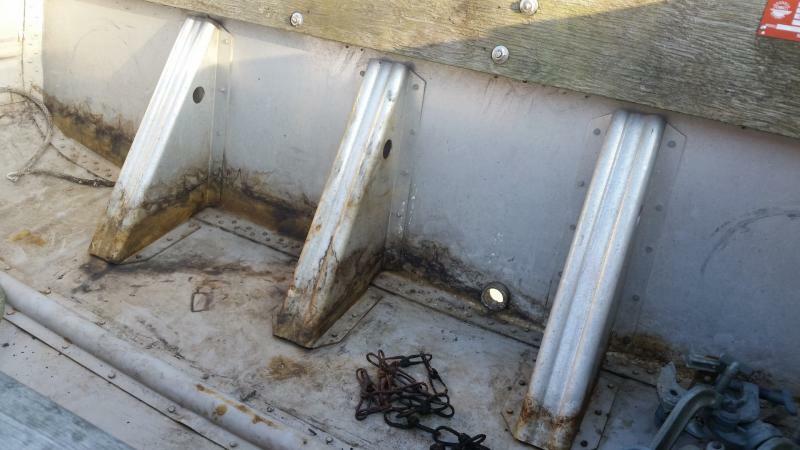 - Replace transom and seat wood... marine ply, coats of spar urethane. - There is foam below the wood seats, will replace unless there is a reason NOT too. - Paint floor - recommendations? - Paint outside - recommendations? I do work at Sherwin-Williams (main office) but am not a paint expert, IT/marketing guy. I was going to ask around internally, but figure I would ask here. - Anyone know a way to spruce up the top front metal "V" at the bow? Is there a good way to restore? Same for other trim pieces. 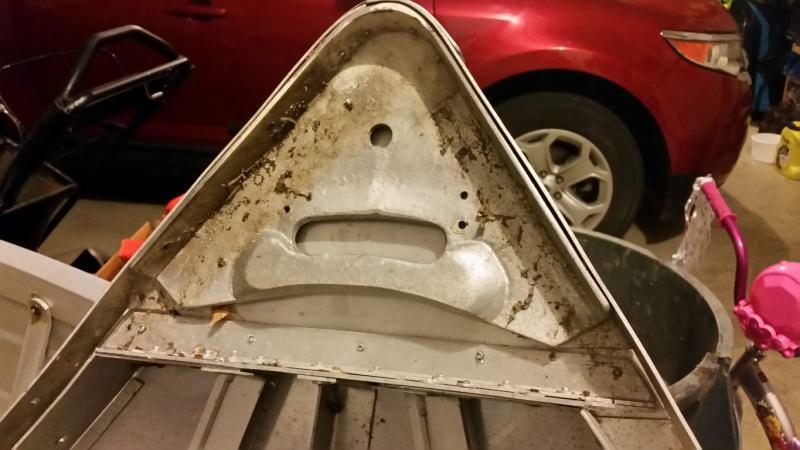 - Replacing screws/bolts/nuts with stainless is ok with aluminum... yes? 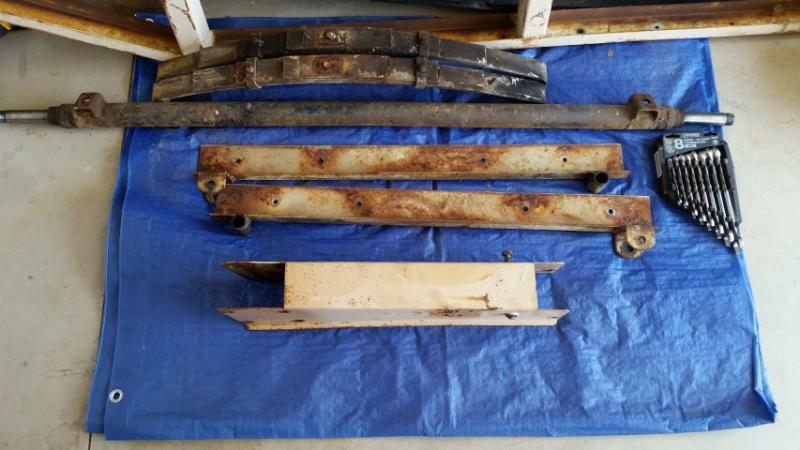 Some of the various fasteners are rusting/old. - The red/green lights are plastic and say Everyready... think those are original? - I can't tell from the tag, what size outboard can I safely put on this? 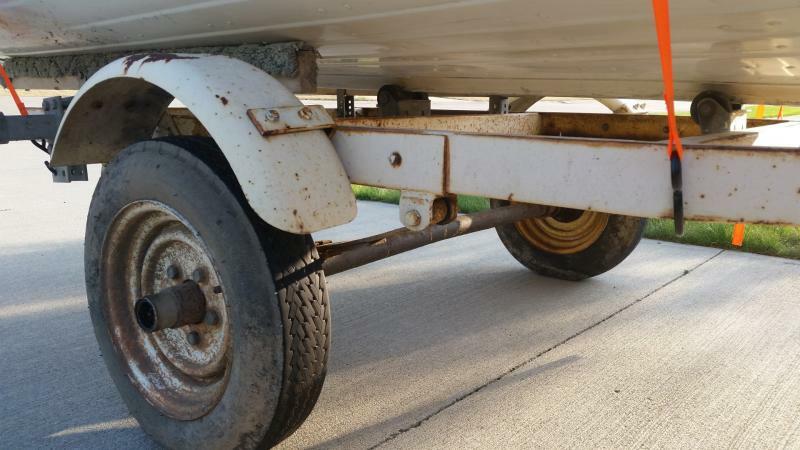 - Regarding the trailer... the wheels are actually loose on the axle, recommendations here? Made for a sloooow ride home. - Tires are 4.80-12 2 ply... I will be replacing with a better tire. And possibly rim. - The trailer lights are shot and not working - need replaced. - What about the bunks and the rollers... is this the correct setup? If so, I will likely replace. Based on pictures, can I replace with same by newer? I think that is about it for now, pretty excited to get going. I appreciate all the help and will likely have many more questions. I have been scouring the forums leading up to this. Thanks everyone, looking forward to the adventure. 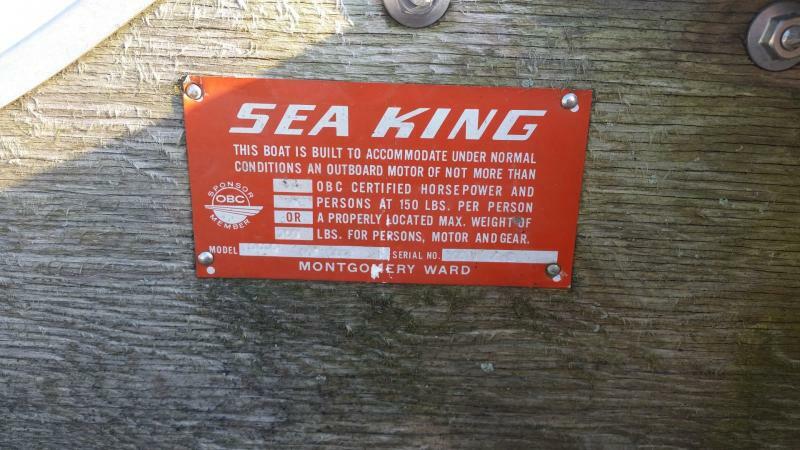 Sea king was the brand name for Montgomery Wards boats, motors and trailer. Wards did not make any of these items they were made by other companies and tagged as Sea King. StarCraft did supply some of the boats. Your boat does have some of the features of a StarCraft made boat. The loose wheels could be the bearings need servicing. That's a handsome looking boat; I don't know if the running lights are original, but I like the style. lckstckn2smknbrls already told you pretty much everything I know about Sea King and I second the need to service, probably replace, your wheel bearings and seals. Although my boat is a Lone Star, I have virtually the same trailer (1967 Sea King instead of 1966) and your bunk and roller set-up look identical to mine, with the exception of the guides. I have a few pictures of my trailer in my project thread here (http://forum.tinboats.net/viewtopic.php?f=3&t=41081), but I did modify the front winch mount to better accommodate the Lone Star. I had to replace the two rear keel roller brackets since I couldn't find replacement rollers of the right diameter (all too large); the standard Atwood replacements fit the existing holes pretty well. 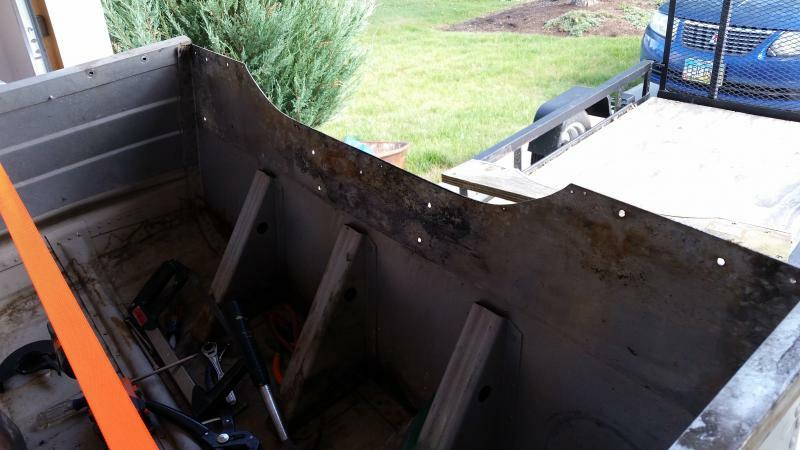 I couldn't find a bracket that would easily replace the forward most of the three keel rollers, so I took a replacement roller and shaved it down to fit the old bracket. I tightened down a sacrificial bolt through the mounting hole, put the end of the bolt in my drill, and spun it on some heavy grit sandpaper on a flat surface. I kept making black dust until the roller was small enough not to bind in the old bracket. I'll be following you enginerd, looks great. 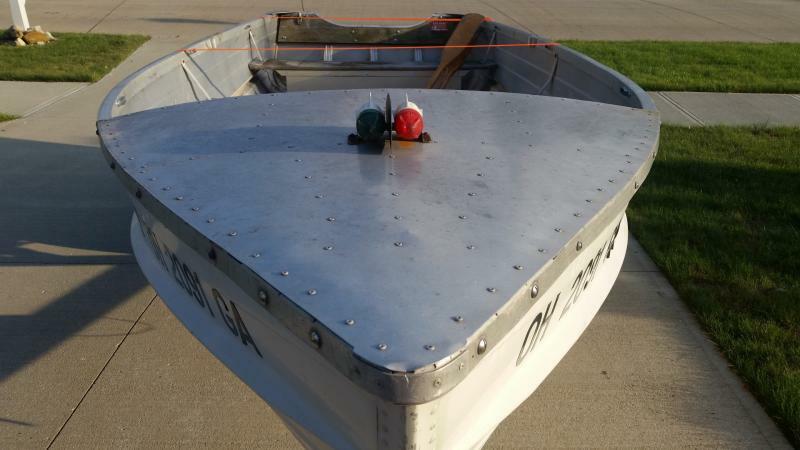 The 9036 model has a length of 13ft 7 in, beam 62 in, weighs 210 lb, 52 in transom width, max hp 35. Thanks for the link. Cool information. 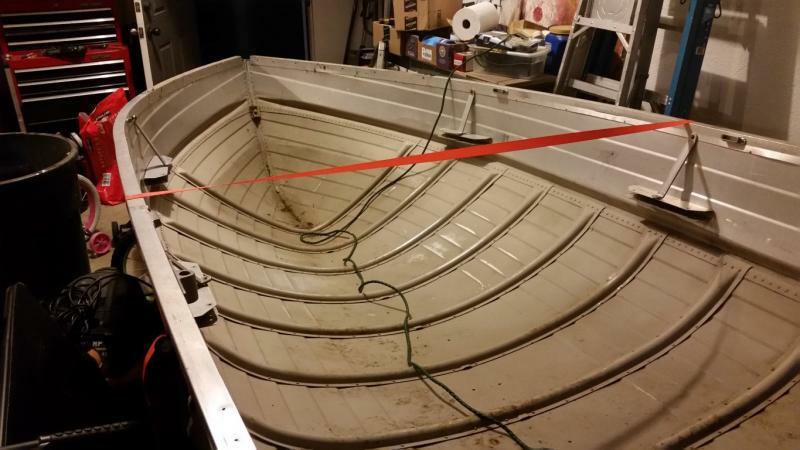 This weekend I removed the transom wood and the seats. Man... what is with all the slotted screws. Just a total pain to break loose, my forearms thank you. Next steps are to remove the wood from top of seats and dispose of the foam (replacing). Also, remove the registration sticker, OH numbers and rear reflector stickers. 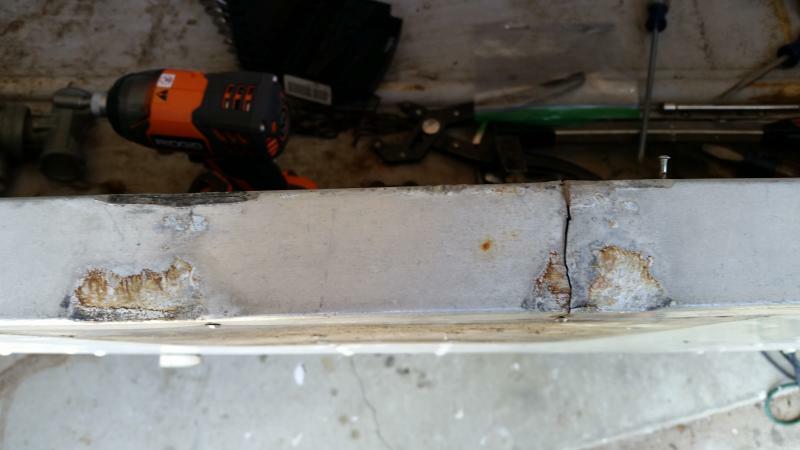 Transom cap is cracked, need to fix that as well. Last night I removed the registration stickers and numbers. 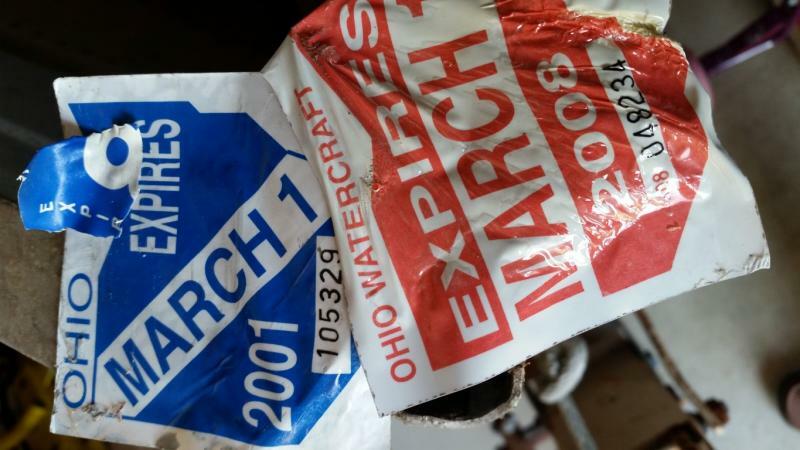 There were 3 Ohio registration stickers on the boat... 2008, 2001, and 1980. Wasn't able to save more than the "8", but there was definitely a "0" next to it. I also removed rear red reflector stickers from the rear and the rear corner caps. Then I removed what I am calling the "bow cap", not sure if that it what it is called. I cannot tell if it was an aftermarket part or not. 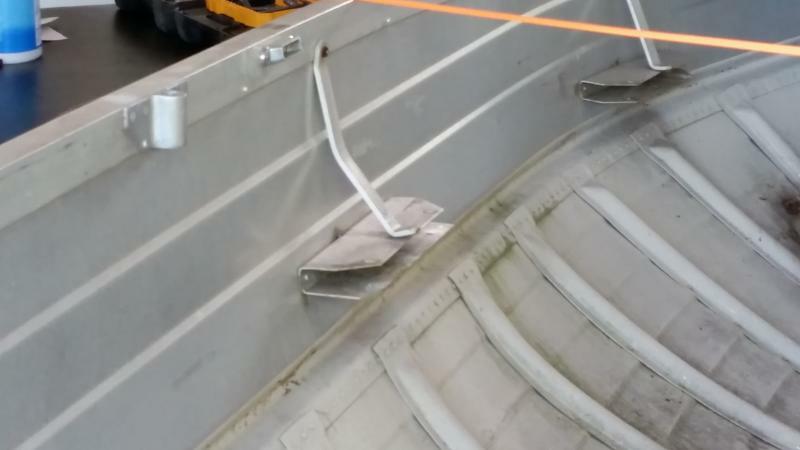 You can see in the pictures the standard "bow handle" is under the bow cap. The fit is perfect so I am leaning towards a factory addition. Finally, I tested some 400 grit on the aluminum rail to clean it up, seemed to work very very well. Did not leave any scratches on the rail. Is this the best approach to bring aluminum back to a reasonable level of shine/newness? I have the trailer completely broken down and ready for sand blast. 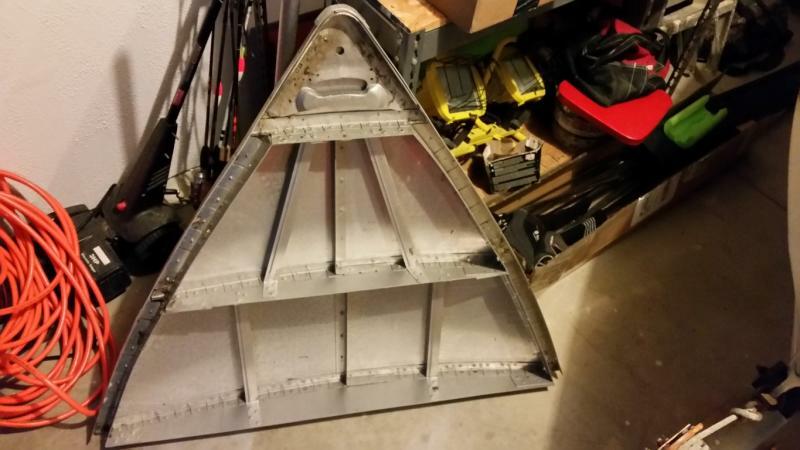 Found a local shop to do the sand blasting of the frame and pieces/parts for $165. Based on my other calls around town, it was a great deal. The hubs were shot, one of the hubs didn't have the bearing sleeves and the other had a loose sleeve. etrailer.com has new hubs for $20/each. 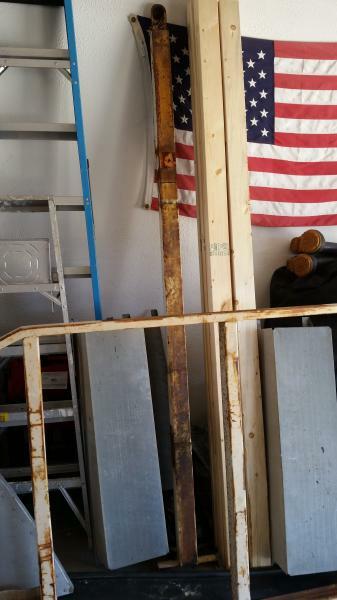 I was going to replaced the leaf springs, but it would require cutting and welding new hangers - couldn't find 29 1/2" eye to eye readily and affordable. 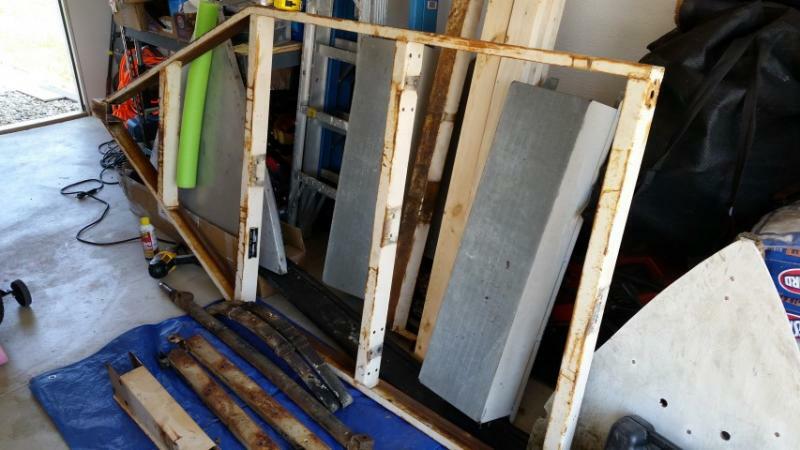 I am going to sandblast the existing leaf springs prime/paint and hope they last for a while. The foam boxes, I am going to sand myself - they wanted $160 to do those alone. Also, having a local shop remove the tires from the rims so those can be sand blasted. 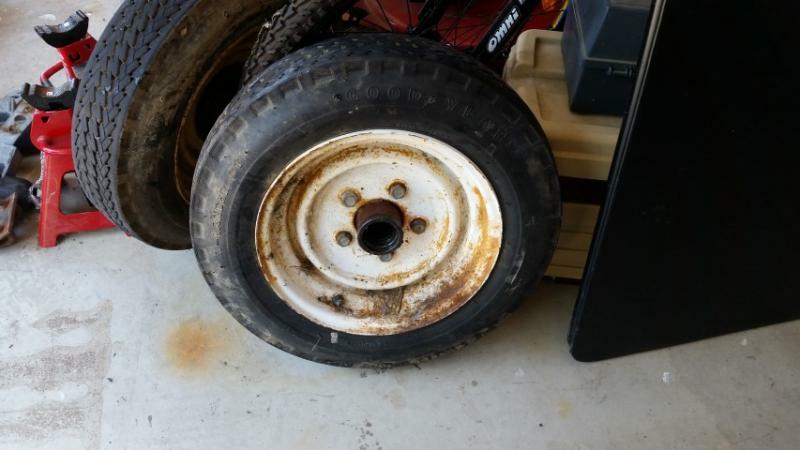 And, new tires to replace the very old 4 plys that are on there now. 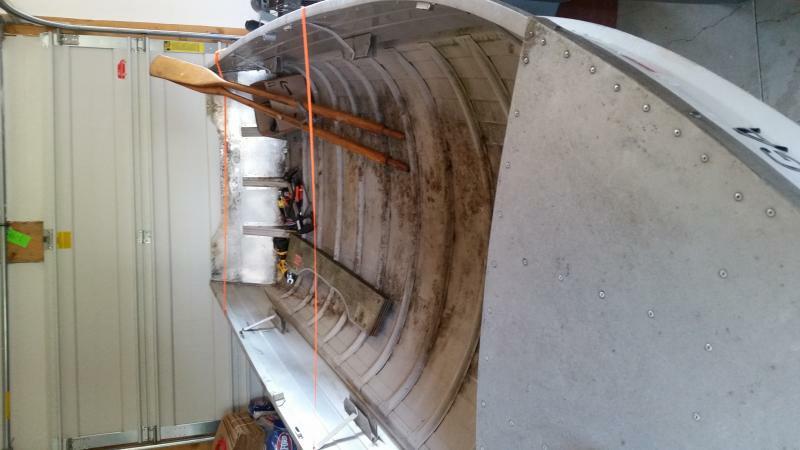 The boat is completely "disassembled" and awaiting paint stripping and prep. With the heat above 85 here in Ohio and super high humidity, unfortunately I am going to have to wait to sand blast and prime the trailer. Likewise with the boat. I want to make sure the finish goes on and stays on. In the mean time, I am working on getting new nuts/bolts to replace the rusted ones. 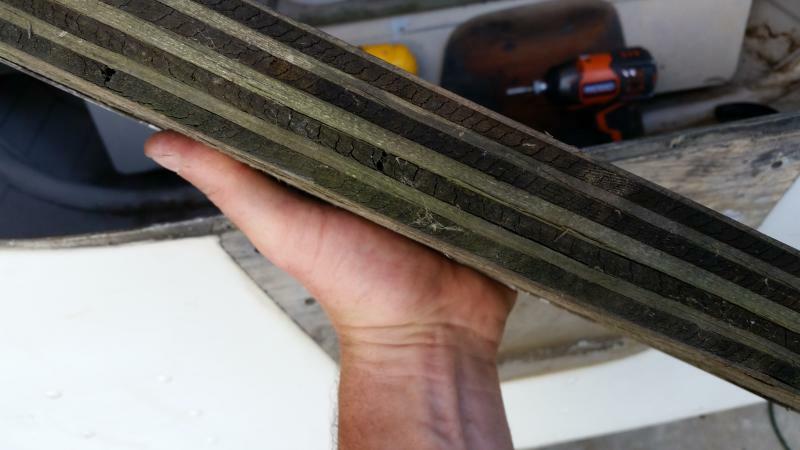 Also, going to replace the slotted screws that were in use around the boat with ANYTHING but slotted - what a pain! 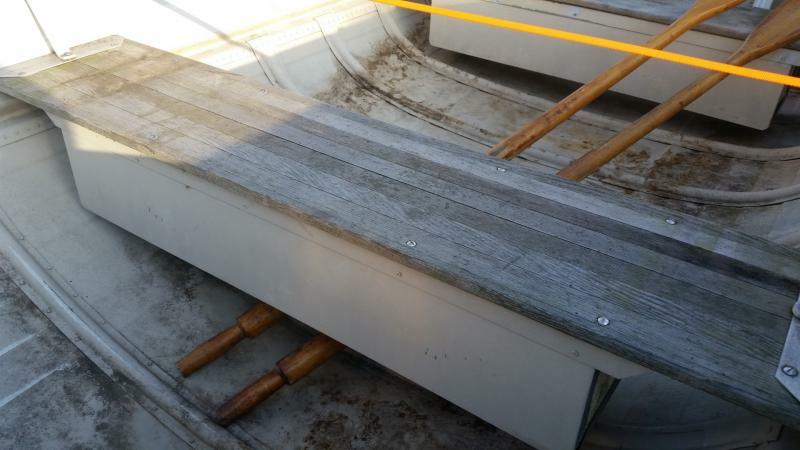 New keel rollers, new bunks are needed as well.